Siphonaria sipho, copyright G. & Ph. Poppe. The Siphonarioidea are a group of gastropods uniting the living Siphonariidae with the tentatively assigned fossil Acroreia. 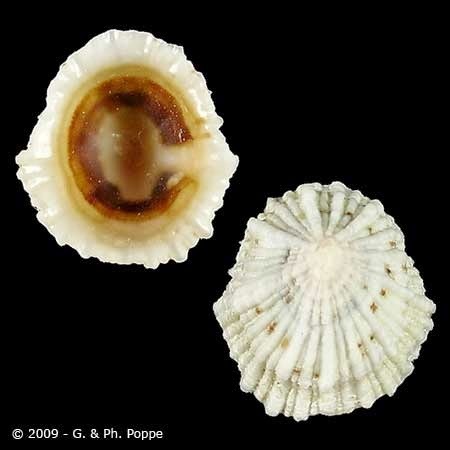 The Siphonariidae, false limpets, are a group of air-breathing limpet-like gastropods found in marine and brackish waters. A lateral pneumostome is present, its position marked by an inner groove on the shell and an interruption in the ring of muscle scars. [E96] Eertman, R. H. M. 1996. Comparative study on gill morphology of gastropods from Moreton Bay, Queensland. Molluscan Research 17: 3–20. [GR98] Giribet, G., & C. Ribera. 1998. The position of arthropods in the animal kingdom: a search for a reliable outgroup for internal arthropod phylogeny. Molecular Phylogenetics and Evolution 9: 481–488. [W77] White, C. A. 1877. Report upon the invertebrate fossils collected in portions of Nevada, Utah, Colorado, New Mexico, and Arizona, by parties of the expeditions of 1871, 1872, 1873, and 1874. U.S. Geographical Surveys West of the One Hundredth Meridian 4 (1): 1–219, pls 211–221.